The German Shorthaired Pointer, or GSP is one of the most popular HPR breeds in the UK. These short coated, good natured dogs, come in a wide range of colours. The most familiar and recognisable of which is the speckled liver and white variety. GSPs are not only popular with rough shooters and as pets, they also make excellent deer stalking companions and can be trained to follow a blood trail over long distances. GSPs are sociable dogs without the temperament issues sometimes reported in their wire-haired cousins. They can and do make a great pet for active families. 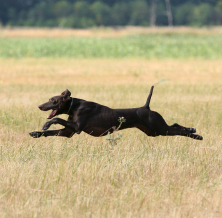 [wp_ad_camp_1]Like all gundog breeds they benefit greatly from gundog training, and from participating in mentally stimulating activities such as gundog work, working trials, or obedience.